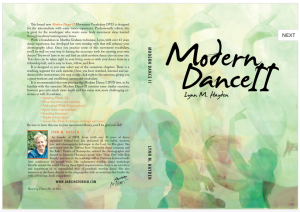 This brand new Modern Dance II/Movement Vocabulary DVD is designed for the intermediate with some dance experience. Professionally edited, this is great for the worshipper who wants some body movement ideas learned through modern/contemporary dance. With a foundation in Martha Graham technique, Lynn, with nearly 50 years dance experience, has developed her own worship style that will enhance your choreography ideas. Once you practice some of this intermediate movement vocabulary, you’ll be well on your way to having the necessary tools for creating your own dances! It is recommended that you practice the Modern Dance I DVD first, to be familiar with the exercises. Modern Dance II contains some similar exercises, however goes into more depth. There are expanded versions of some exercises found in Modern I and some all new exercises as well. Be sure to add this one to your cart, you’ll be glad you did!